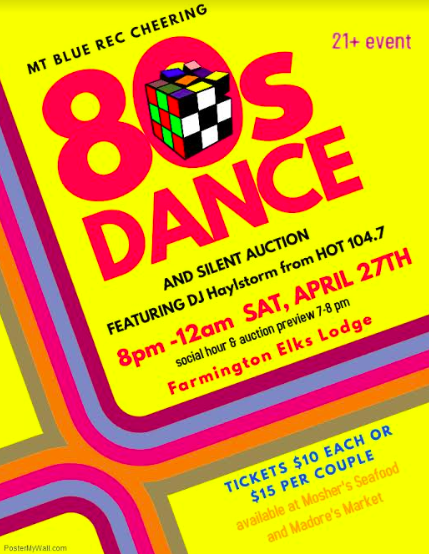 FARMINGTON - Mt Blue Rec Cheering will be hosting an 80’s Dance and silent auction fundraiser at the Farmington Elks Lodge on Saturday, April 27, from 7 p.m. to Midnight. Social hour and auction preview 7 p.m. to 8 p.m., and DJ Haylstorm from HOT 104.7 will be playing a variety of 80’s Hits from 8 p.m. until midnight. Tickets are $10 each or $15 per couple and must be purchased in advance. Tickets will be available at Madore’s Market and Mosher’s Seafood. This is an Adult Only event. For more information please email mtbluereccheering@gmail.com or checkout our Facebook event page MBRC 80’s Dance & Silent Auction at https://www.facebook.com/events/292127834787529/.